This article is about the musical. For the film, see School of Rock. For the television series, see School of Rock (TV series). School of Rock is a rock musical with music by Andrew Lloyd Webber, lyrics by Glenn Slater and a book by Julian Fellowes. Based on the 2003 film of the same name, written by Mike White, the musical follows Dewey Finn, an out-of-work rock singer and guitarist who pretends to be a substitute teacher at a prestigious prep school. After identifying the musical talent in his students, Dewey forms a band of fifth-graders, in an attempt to win the upcoming Battle of the Bands contest. The musical was announced in December 2014 and opened just under a year later on December 6, 2015. Prior to School of Rock's debut, staged concerts were held at the Gramercy Theatre in Manhattan in June 2015. It made its Broadway debut and world premiere at the Winter Garden Theatre on December 6, 2015 following previews that began on November 9, 2015, with direction by Laurence Connor and choreography by JoAnn M. Hunter, and starring Alex Brightman and Sierra Boggess as Dewey Finn and Rosalie Mullins, respectively. The musical made its West End debut at the Gillian Lynne Theatre on November 14, 2016. The musical begins with a performance by the band No Vacancy. The band's guitarist, Dewey Finn, repeatedly attempts to upstage the lead singer ("I'm Too Hot for You”) which leads to the band agreeing to kick him out for his antics after Dewey leaves the stage. The next morning, Dewey is awoken in his bedroom by his longtime friend, Ned Schneebly, and Ned's domineering girlfriend, Patty Di Marco. Patty demands rent from Dewey while Ned cowers behind her. After they leave, Dewey goes about his day, getting kicked out of his band and fired from his job at a record store, all while dreaming about getting his break and becoming a superstar ("When I Climb to the Top of Mount Rock.") Afterwards, Dewey receives a call from Rosalie Mullins, principal of the prestigious Horace Green School. She asks to speak to Ned, saying that the school has an open substitute teacher position that will pay over nine hundred dollars a week—enough to meet the rent. Dewey, pretending to be Ned, accepts. At the apartment, Patty asks Ned to go on a jog with her, but he declines, claiming he has a lot of papers to grade. Understanding, Patty goes. As soon as she's gone, however, Ned pulls out his Guitar Hero console and begins playing. When Dewey comes home, he joins Ned and they discuss various topics such as teaching and their old band ("Variation 7”). After their game, Dewey attempts to convince Ned to rejoin him in their music career, by reminding him of all the perks of being a rockstar ("Children of Rock”). However, Patty arrives and breaks the men's reminiscing session up. Angry at Dewey, Patty reminds him that he's nothing more than a dreamer who will never succeed in the rock business, and gives him an ultimatum: pay the rent in thirty days, or they’ll kick him out ("Give Up Your Dreams"). The next day at school, Dewey argues with another teacher and hears music coming from one of the classrooms. Upon learning that his students are in music class with Rosalie ("Queen of the Night"), he inquires in amazement about what instruments they play. Dewey then tells his students that they're now a part of his new band set to compete in the Battle of the Bands. First, he puts together the instrumentals of his band: Zack on electric guitar, Katie on bass, Lawrence on keyboard, and Freddy on drums. He also makes two of the girls—Shonelle and Marcy—backup singers, and two other girls—Madison and Sophie—roadies. Then he moves onto technical jobs. Mason is put in charge of lights, James is made the security officer, and an ecstatic Billy is made the band's stylist. Summer is angry that she hasn't been given a job and says "groupies are sluts" in response to Dewey's first suggestion. Dewey then makes her the band's manager. The only student left without a job is Tomika, the shy new girl ("You're in the Band"). Confident about their prospects, Dewey hands out famous CDs to the students to listen to as homework ("You're in the Band (Reprise)”). Upon hearing that Rosalie is coming, students quickly cover their instruments with Thanksgiving themed items and Dewey breaks into a fake lesson. When she challenges this, Dewey accuses other teachers of being on crack before admitting that he uses music to teach "boring" subjects. After arguing that there are no boring subjects, Rosalie announces that she'll be sitting in for the rest of Dewey's lesson. Nervous, Dewey pulls out his guitar and improvises a song about math ("Math Is a Wonderful Thing.") Rosalie is unimpressed, but Dewey decides to ask her out to a bar regardless. Later that night, Rosalie and Dewey meet at the bar, and, after having a few drinks, Dewey plays a Stevie Nicks song on the jukebox, causing Rosalie to let loose and laments about how she feels she's lost her inner music. Stating that Dewey has reminded her about it, she promises that if the parents' meeting goes well the next day, she'll help Dewey and School of Rock go to The Battle of the Bands ("Where Did the Rock Go?") Dewey impulsively kisses Rosalie, and they part ways. Freddy (Drummer): Freddie is a rambunctious boy, as shown when he repeatedly slams cymbals together disruptively during music class. He is constantly told he isn't intelligent—by both his own father and Summer—but Freddie and Dewey both think that he's intelligent in a different way, and that Freddie's father just doesn't see that. The Broadway production closed on January 20, 2019, after 31 previews and 1,309 regular performances. On 20 May 2016 the musical was confirmed at the Gillian Lynne Theatre instead of the Palladium with previews starting on 24 October 2016, opening night on 14 November 2016, and public booking opening on 25 May 2016. Lloyd Webber revealed that the production was able to open several months earlier than anticipated due to finding the child musician actors easily. Anna Louizos' scenery has been modified to fit the architecture of the Gillian Lynne Theatre from the traditional proscenium arch stage at Winter Garden Theatre. Changes include the removal of the pre-show curtain, the use of a revolving stage and action taking place in the aisles of the stalls. While the show remains to be set in America, the script has been adapted to include some minor references for a British audience. The US tour opened on September 30, 2017 at the Auditorium Theatre in Rochester, New York. Rob Colletti starred as Dewey Finn, with Lexie Dorsett Sharp as Rosalie Mullins. On October 1, 2018, Merritt David Janes replaced Colletti as Dewey Finn. School of Rock 's Australian production opened at Her Majesty's Theatre, Melbourne, on 31 October with a November 9 premiere. Each show features one of three alternating child casts, nicknamed the Midnight Oil, Cold Chisel, or AC/DC casts.Half way through the seasons the child casts were shuffled and re-named Toto, Queen and KISS. After closing in Melbourne, the show embarked on a national tour of China beginning in Shanghai before continuing to Beijing, Guangzhou, Xiamen, Shenzhen and Suzhou. The production will then return to Australia in July 2019, where it will play QPAC in Brisbane and the Capitol Theatre in Sydney before going to Auckland, New Zealand. "I'm Too Hot for You" reuses the melody of "I've Been in Love Too Long", a track originally written by Lloyd Webber, with lyricist Don Black, for Marti Webb's 1981 album, Won't Change Places. Most reviews of School of Rock were positive. Many focused on the child performers. David Rooney, for The Hollywood Reporter, praised the young rockers, "the show knows full well that its prime asset is the cast of ridiculously talented kids, ranging in age from nine to 13. They supply a joyous blast of defiant analog vitality in a manufactured digital world." David Cote wrote for Time Out: New York, "We expect cute kids in uniform, a spastic Dewey and face-melting riffs—along with heart-tugging family stuff. It worked for the movie, and wow, does it work on Broadway ... For those about to love School of Rock: We salute you." Robert Kahn of WNBC television station in New York concurred, "The story doesn’t particularly resonate for me, but I won’t soon forget the feel-good vibe radiating off the talented young performers"
Cote noted, "You’d have to have zero sense of humor about pop to not enjoy Webber’s jaunty pastiche score, which sneaks elegant melodies in among the boilerplate stadium stompers." But Jones suggested, "the ever-savvy Andrew Lloyd Webber has kept himself and his ditties more in the background". Marilyn Stasio of Variety noted, "Having written songs for alley cats and toy trains, Webber has the ideal sensibility to relate to children whose freakish talents might make them seem a little bit … peculiar, in a world of average Joes." Kahn stated, though: " I don’t imagine most of the big numbers here will enjoy an afterlife; they’re inferior to his earlier confections." Jack Black himself attended a Sunday performance, and afterwards told the cast backstage, "There were so many times I went, ‘I could not have done it that well.’ You made me laugh. You made me cry. You made me rock.’"
^ "School of Rock musical set for Broadway". bbc.co.uk/news. BBC News. 19 December 2014. Retrieved 29 December 2014. ^ Harris, Dana (12 October 2013). "Two longshots show B.O. promise in tricky slots". variety.com. Variety. Retrieved 1 January 2015. ^ Reaney, Patricia (18 December 2014). "'School of Rock - The Musical' to open on Broadway in 2015". uk.reuters.com. Reuters. Retrieved 1 January 2015. ^ "Jack Black's 'School of Rock' In Session". Billboard. 30 September 2003. Retrieved 1 January 2015. ^ "'School of Rock' Musical to Hit Broadway Next Year". rollingstone.com. Rolling Stone. 18 December 2014. Retrieved 1 January 2015. ^ Hooton, Christopher (19 December 2014). "School of Rock musical confirmed for 2015". independent.co.uk. London: The Independent. Retrieved 1 January 2015. ^ "Andrew Lloyd Webber Penning 'School of Rock' Musical for Broadway". nbcnewyork.com. NBC New York. 19 December 2014. Retrieved 1 January 2015. 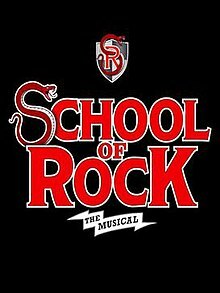 ^ "Musical of 'School of Rock' heading to Broadway with Andrew Lloyd Webber adding songs". foxnews.com. Fox News. 18 December 2014. Retrieved 1 January 2015. ^ "Andrew Lloyd Webber to stage School Of Rock musical". bbc.co.uk/news. BBC News. 10 April 2013. Retrieved 1 January 2015. ^ "Andrew Lloyd Webber enrols in School of Rock musical?". whatsonstage.com. Whats On Stage. 15 April 2013. Retrieved 1 January 2015. ^ "Andrew Lloyd Webber May Pen Additional Songs for Stage Adaptation of Jack Black's "School of Rock"". playbill.com. Playbill. 9 April 2013. Retrieved 1 January 2015. ^ "Theatre composer plans School of Rock musical based on the Jack Black film to follow Profumo affair 'chamber musical'". theguardian.com. The Guardian. 8 April 2013. Retrieved 1 January 2015. ^ "Broadway May Be First Stop for Andrew Lloyd Webber's School of Rock Musical". playbill.com. Playbill. 15 May 2014. Retrieved 1 January 2015. ^ a b Singh, Anita (15 May 2014). "Andrew Lloyd Webber may head for Broadway after Stephen Ward flop". telegraph.co.uk. London: The Telegraph. Retrieved 1 January 2015. ^ Shenton, Mark (Aug 2, 2015). "Andrew Lloyd Webber: 'I'm back – and I want another hit'". The Stage. Retrieved 10 August 2015. There’s also a pragmatic reason for premiering School of Rock on Broadway, and that’s because schools of rock actually exist in the US – and they produce the sort of kids required who can actually perform in the show. "If it ever goes to London, it’s going to be a lot harder to cast. There’s a very different culture with the kids here [in the US], where they can go to these schools to learn to play the guitar or whatever at the age of nine or 10. And what’s amazing is that they’re playing British rock from my time when Superstar was being recorded next door to Led Zeppelin at the Olympic studio. Whereas nowadays in Britain the kids are sitting at home with their computers and generating songs that way. ^ Healy, Patrick (18 December 2014). "Andrew Lloyd Webber's 'School of Rock' Musical Coming to Broadway in November". nytimes.com. The New York Times. Retrieved 1 January 2015. ^ "Andrew Lloyd Webber Eyeing Broadway Before London for School of Rock Musical". broadway.com. Broadway Dot Com. 15 May 2014. Retrieved 1 January 2015. ^ Cox, Gordon (18 December 2014). "'School of Rock' Will Rock Broadway with Andrew Lloyd Webber". variety.com. Variety. Retrieved 1 January 2015. ^ "Andrew Lloyd Webber kicks out the jams with School of Rock musical". theguardian.com. The Guardian. 19 December 2014. Retrieved 29 December 2014. ^ "Andrew Lloyd Webber's School of Rock Will Shake Up Broadway Next Fall". playbill.com. Playbill. 18 December 2014. Retrieved 29 December 2014. ^ "'The School of Rock' to be adapted into Broadway musical". nydailynews.com. Daily News. 18 December 2014. Retrieved 29 December 2014. ^ "Andrew Lloyd Webber's School of Rock to open on Broadway next December". thestage.co.uk. The Stage. 19 December 2014. Retrieved 29 December 2014. ^ "School of Rock – The Musical @ Winter Garden Theatre | Playbill". Playbill. Retrieved 2016-03-18. ^ a b Danton, Eric R. "Listen to the 'School of Rock' Musical Original Cast Recording (Exclusive Album)". WSJ. Retrieved 2016-03-18. ^ Hoffman, Barbara (18 December 2014). "Jack Black's 'School of Rock' is Broadway-bound". nypost.com. New York Post. Retrieved 1 January 2015. ^ "Are You Ready to Rock? Broadway's School of Rock Launches Open Call for Kid Stars and Jack Black Role". playbill.com. Playbill. 9 January 2015. Retrieved 9 January 2015. ^ "Jack Black, Step Back! Alex Brightman Will Headline Broadway's School of Rock". playbill.com. Playbill. 29 May 2015. Retrieved 30 May 2015. ^ a b Itzkoff, Dave (29 May 2015). "Andrew Lloyd Webber to Share Early Version of 'School of Rock'". nytimes.com. New York Times. Retrieved 30 May 2015. ^ "Sierra Boggess Graduates to Broadway's School of Rock". playbill.com. Playbill. 12 June 2015. Retrieved 12 June 2015. ^ "Broadway's School of Rock Confirms Lead, Pushes Back Previews, Puts Tix on Sale Today". playbill.com. Playbill. 11 June 2015. Retrieved 12 June 2015. ^ "Musical of 'School of Rock' heading to Broadway". dailymail.co.uk. London: Daily Mail. 18 December 2014. Retrieved 1 January 2015. ^ "Tickets Go on Sale Tomorrow for Broadway's SCHOOL OF ROCK". broadwayworld.com. Broadway World. 10 June 2015. Retrieved 12 June 2015. ^ "'School of Rock' musical opening on Broadway in 2015". latimes.com. Los Angeles Times. 18 December 2014. Retrieved 1 January 2015. ^ "School of Rock to make West End transfer". whatsonstage.com. Whats On Stage. 7 December 2015. Retrieved 11 December 2015. ^ "SCHOOL OF ROCK - THE MUSICAL confirmed for West End October 2016". bestoftheatre.co.uk. Best of Theatre. 20 May 2016. Retrieved 20 May 2016. ^ "'Hamilton' tour coming to Rochester, plus 'School of Rock,' 'On Your Feet,' more". NewYorkUpstate.com. Retrieved 2017-04-30. ^ Desk, BWW News. "Stick it to the Man! Rob Colletti to Lead SCHOOL OF ROCK National Tour; Full Cast Announced". BroadwayWorld.com. Retrieved 2017-08-24. ^ "Andrew Lloyd Webber's School of Rock Musical Can Play Your School This Winter". playbill.com. Playbill. 12 October 2015. Retrieved 13 December 2015. ^ "Andrew Lloyd Webber Will Pen Tunes for School of Rock Musical". time.com. Time Magazine. 18 December 2014. Retrieved 29 December 2014. ^ ""School of Rock" Writer Mike White Takes a Visit to the New Broadway Musical". playbill.com. Playbill. 20 November 2015. Retrieved 13 December 2015. ^ "Broadway's Gonna Get Schooled! Andrew Lloyd Webber's School of Rock Confirms B'way Dates and Theater". broadway.com. Broadway Dot Com. 18 February 2014. Retrieved 2 January 2015. ^ a b "School of Rock The Musical Songs". ibdb.com. Internet Broadway Database. Retrieved 11 December 2015. ^ "Andrew Lloyd Webber's School of Rock Will Get Broadway Cast Album". playbill.com. Playbill. 14 September 2015. Retrieved 13 December 2015. ^ "Listen to the 'School of Rock' Musical Original Cast Recording (Exclusive Album)". blogs.wsj.com. The Wall Street Journal. 2 December 2015. Retrieved 11 December 2015. ^ "School of Rock the Musical: Get a mega-sized first look at Broadway's new class". ew.com. Entertainment Weekly. 3 December 2015. Retrieved 13 December 2015. ^ "Cast Recording of Andrew Lloyd Webber's School of Rock Released Today". playbill.com. Playbill. 4 December 2015. Retrieved 13 December 2015. ^ "Review Roundup: You're in the Band! School of Rock Opens on Broadway- All the Reviews!". broadwayworld.com. 6 December 2015. Retrieved 17 April 2016. ^ a b c Rooney, David (6 December 2015). "School of Rock: Theatre Review". The Hollywood Reporter. Retrieved 17 April 2016. ^ a b c Cote, David (17 August 2015). "School of Rock". Time Out: New York. Retrieved 17 April 2016. ^ a b Kahn, Robert (6 December 2015). "He's Committing Fraud, but the Kids Love Him". NBCUniversal, LLC. Retrieved 17 April 2016. ^ a b c Kahn, Robert (6 December 2015). "School of Rock Review: An Andrew Lloyd Webber Spectacular". AM: New York. Retrieved 17 April 2016. ^ Jones, Chris (6 December 2015). "School of Rock on Broadway: The Kids are Better Than All Right". Chicago Tribune. Retrieved 17 April 2016. ^ Jones, Chris (6 December 2015). "Broadway Review: School of Rock, the Musical". Variety. Retrieved 17 April 2016. ^ Dale, Michael (7 December 2015). "BWW Review: Andrew Lloyd Webber Returns To Rebellious Mode In Kickass Fun School of Rock". broadwayworld.com. Retrieved 17 April 2016. ^ Romano, Nick (May 1, 2016). "Jack Black meets the cast of Broadway's 'School of Rock'". Entertainment Weekly. Retrieved May 2, 2016. This page was last edited on 7 April 2019, at 13:59 (UTC).